William Penn Villas in Montgomery County, Pennsylvania is an active adult community in Royersford. This established neighborhood of detached and attached homes welcomes homebuyers aged 55 and better. Residents of William Penn Villas enjoy living in a community that has a vibrant social scene and numerous amenities. William Penn Villas caters to the active adult lifestyle with well-designed amenities where homeowners enjoy a socially active lifestyle within the clubhouse. Residents never have to pay for an expensive gym membership because a well-equipped exercise room is at their disposal. Whether meeting friends at the bocce ball court to exchange friendly competition or taking a quiet walk along the trails, you'll be sure to find an activity that sparks your interest while living in William Penn Villas. 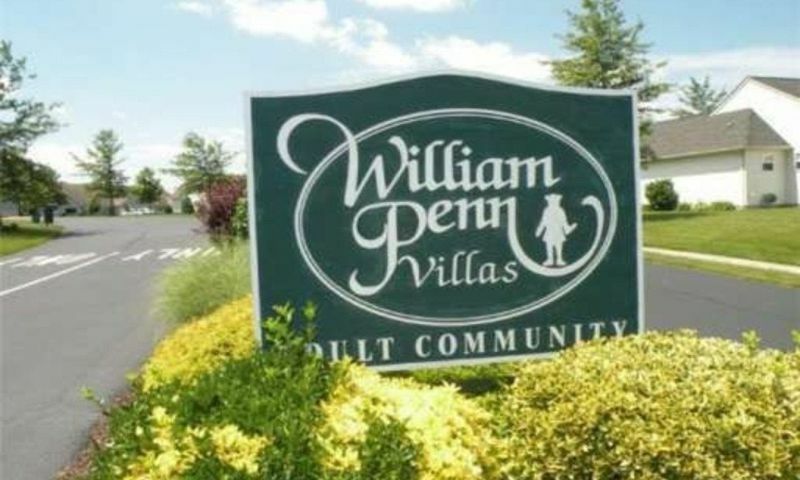 William Penn Villas is an 87-home active adult community in Montgomery County, Pennsylvania. Available on a resale-only basis, the majority of residences within this community were built between 2000 and 2004. Attached homes within William Penn Villas are ranch-style residences that are approximately 1,194 to 1,885 square feet in size. Generally, they were built with two to three bedrooms, two to three bathrooms, and an attached one or two-car garage. Single-family ranch homes offer approximately 1,414 to 2,996 square feet of living space. William Penn Villas' detached homes were built with two to four bedrooms, two to three bathrooms, and an attached two-car garage. Homeowners live a carefree lifestyle with an established homeowners association (HOA). The HOA fee includes lawn care, snow removal, weekly trash and recycling pickup, as well as roof replacement. This allows residents of William Penn Villas more time to enjoy and plan activities throughout the year. There are clubs and events that often meet within the clubhouse like book club, card games, and holiday gatherings. Socializing and making new friends is never difficult because the community hosts happy hours and coffee hours on a regular basis. William Penn Villas is located in Royersford, Pennsylvania. This active adult community in Montgomery County is located near Route 422 and the Limerick Outlets. Situated in Limerick Township, residents have easy access to airports. Philadelphia International Airport is about an hour s drive away as well as big-city attractions in Philadelphia. William Penn Villas in Limerick Township offers affordable homes, desirable amenities, and a social scene ideal for 55+ homebuyers. There are plenty of activities available in William Penn Villas. Here is a sample of some of the clubs, activities and classes offered here. Attached homes within William Penn Villas are ranch-style residences that are approximately 1,194 to 1,885 square feet in size. Generally, they were built with two to three bedrooms, two to three bathrooms, and an attached one or two-car garage. Please Note: Floor plans are not available at this time. Single-family ranch homes offer approximately 1,414 to 2,996 square feet of living space. William Penn Villas' detached homes were built with two to four bedrooms, two to three bathrooms, and an attached two-car garage. Please Note: Floor plans are not available at this time. WPV is a good neighborhood is you want the basics for a good price. I bought my place a couple years ago and so far so good. The amenities are ok but I don't use them that often. I like getting together with the guys for poker night and game night at one of our favorite local bars. 55places.com is not affiliated with the developer(s) or homeowners association of William Penn Villas. The information you submit is distributed to a 55places.com Partner Agent, who is a licensed real estate agent. The information regarding William Penn Villas has not been verified or approved by the developer or homeowners association. Please verify all information prior to purchasing. 55places.com is not responsible for any errors regarding the information displayed on this website.